Following our weekend with 5 Lappies Smilla and Susi returned home on the Monday (6th July) leaving just Zack with us who was here until Wednesday (15th) when his hudad came to collect him. Zack is always a pleasure to have as a guest however since his last stay he has developed a rather annoying habit of awakening each morning at 5.00 :-( No matter, a quick run in the garden sees him settle for another few hours. Our latest guest arrived yesterday - Miia is with us for a couple of weeks whilst her hufamily enjoy some sun, sand and sangria. 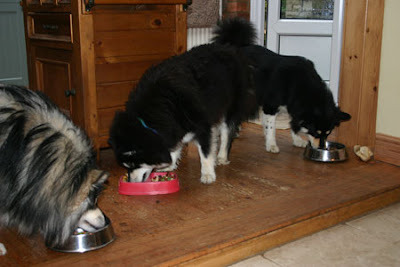 Kiva and Mylo have met her a number of times before as she is a regular on our mass Lappy walks - we were all confident that the 3 dogs would all get along fine - apart from the manic 15 minutes when she arrived. This mad 1/4 of an hour has become the norm - the guest dog/s have a rough and tumble with Kiva and Mylo as they try and work out the heirarchy - bizarrely the results are pretty constant - Mylo is most definately top dog (well I like to let him thinks so) and the rest are equals. Miia is a very tactile dog - she just loves human company though the attraction of 2 other dogs with whom to play was obviously a pleasure for her. Walking with her is a joy - she is not a puller at all and as a result our afternoon walk was a joy - made even more pleasurable by an invitation from one of our friends in the village to see her 9 Clumber Spaniel puppies - just 5 days old :-). Whilst I ooohed over the puppies Kiva, Mylo and Miia played in the garden with a couple of chocolate Labradums, a Dumber Spaniel and a cross Border/Lakeland Terrier - fun and games for all. 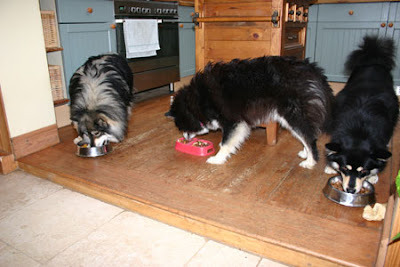 On our return it was time to get the dogs fed - our aim is to manage to get all of the dogs fed at the same time and in the same place - not always easy but a great way to establish some order. one does have a tendency to scoot around the floor. 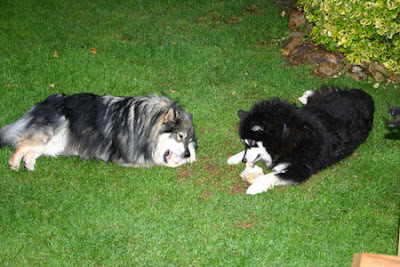 After eating Mylo and Miia enjoyed a post dinner bone. The evening was relaxed, Miia alternating between sitting on the floor, on the sofa, in the kitchen or playing in the garden - the 3 dogs really do get on well. Time came for us to put them down for the night - no problems there .... well for 30 minutes or so when Miia started to make herself heard, a subtle bark or 2 causing me to come back downstairs to check on them - Miia appeared to be annoyed that Kiva and Mylo wouldn't allow her to join them in the kennel. Settled down again it was back upstairs for me - well for 10 minutes or so before Miia started to howl - by howl I mean HOWLLLLLLL - mmm, what to do? Perhaps she would be better upstairs with us - well that worked well as I was next awoken at 7.30am by Miia rolling over and falling off the bed - bless, a new day at Dogs to Stay has begun.